State of The Tavern Keeper - I've Been Drained - No Level Loss but I See More Light! Well, I survived the afternoon in the ER. Good news is, I found an efficient and dare I say pleasant (all things considered) ER so I'm filing that away for future reference. The oral abscess is drained and I'm feeling somewhat better. I expect more pain to set in as the night goes on. Head back tomorrow to have the dental drain/stitch removed. Joy. 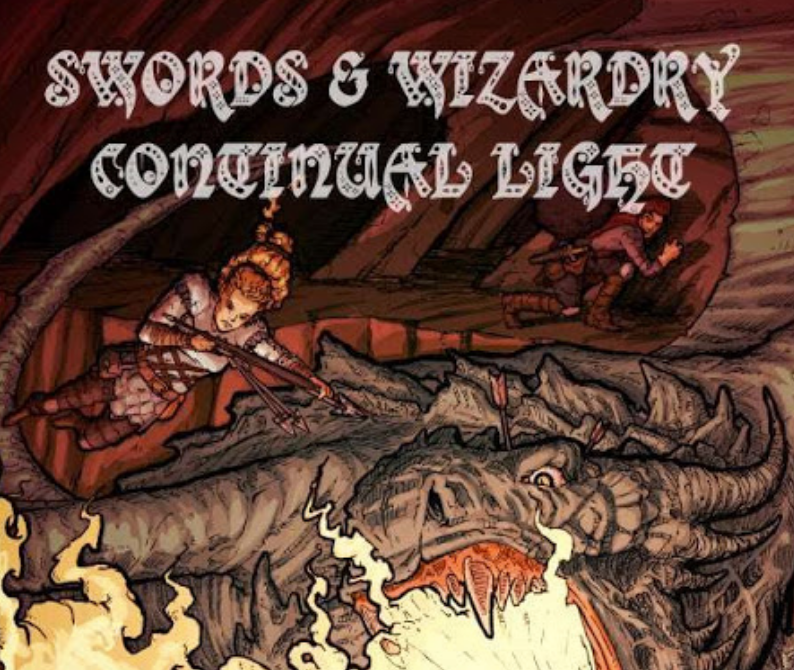 In the meantime, the team has been building itself organically behind the Swords & Wizardry Continual Light Revised Edition. Yes, the 2.0 reference was a joke. The Revised Edition will be 100% compatible with the current edition. Some rules might get more thorough explanations but what you currently have in your hand is "the rules". It's not changing. What we are doing is "adding". Rob Conley will be providing a sandbox setting and we've confirmed six authors thus far for the 7+ adventures we intend to include - in no particular order: James Spahn (White Star / Barrel Rider Games), Pete Spahn (WWII: Operation White Box / Small Niche Games), Tim Shorts (Gothridge Manor / GM Games), Skeeter Green (Frog God Games / Editor / Project Manager) and Rocky Gardner & Ian McGarty of Silver Bulette Publishing (The Silvery Moon Tavern). I have multiple offers to provide a more professional layout that is compatible with the major POD services (I'll address this over the weekend when I've recovered a bit more from today's activities). This truly is a community project, by the community and for the community. I am honored to be a part of this. There is an off chance we may hit the magic number (48 pages) for a hardcover release in addition to softcover. As for a digest-sized version, while not part of the initial release the plan is to offer such afterward. When will this be ready? 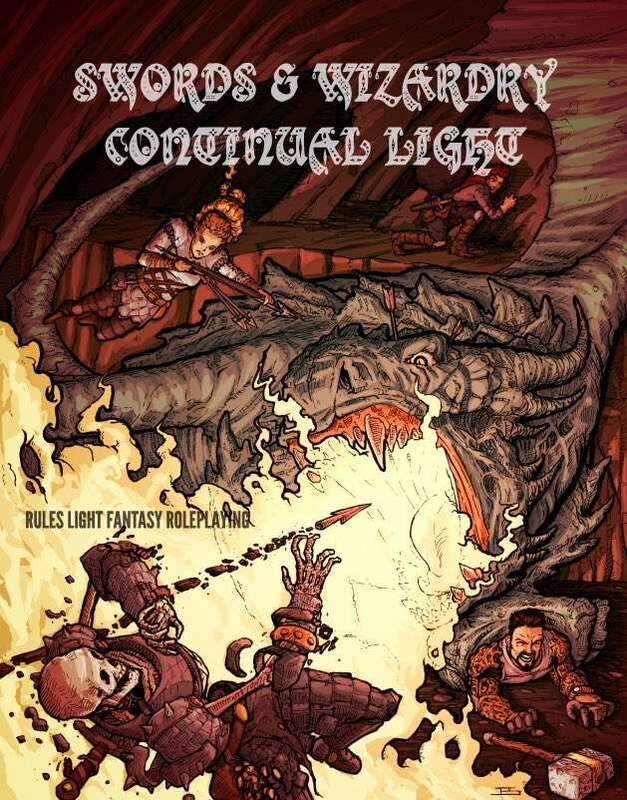 While the PDF MIGHT release in time for NTRPG Con in June, I don't foresee time enough for proofs and related revisions. So, don't look or it unless you are told otherwise. We are producing a series of high quality, self-standing leather-lite dice bags that will make you drool. We call this material Leather-Lite and we're enhancing them by adding our original graphics, many that were used to create our dice trays prior to this. This material is man-made and holds images extremely well . The material is also very durable and light weight.This is a similar material that we use to wrap our dice trays with, but in a rich brown color. These awesome dice bags are sure to be a hit at your gaming table! Size: Each bag measures 7x5x5 inches and holds approx. 400 16mm polyhedral dice with ease. Practically guaranteed to get your carryon pulled for further inspection by the TSA next time you leave Gary Con. Seriously, that's a large dice bag. 19 Bucks a bag plus 5 to ship in the states. We will have a topic tonight - Swords & Wizardry Continual Light 2.0 No rules changes, but new, more professional layout, a sandbox setting by none other than our own +Rob Conley and seven adventures by myself, +James Spahn and players to be named later. The adventures will be 2 to 3 pages long (Rob's sandbox about 4 pages). Not going to venture a guess yet on total pages for the new version. Where is Tavern Chat? Its held every Wednesday Night on The Tavern's Discord Server. We mostly use voice on Wednesday Nights (with additional conversation in the Tavern Chat Text Channel) Throughout the week the main text channel is hopping on a daily basis. There is stuff that needs to get done and this week has pretty much been a lot of wheel spinning. WTC Health appointment took most of yesterday afternoon. Today, the afternoon was spent at the dentist, then referred to an oral surgeon and finally left at 6PM still owning an infected tooth and the accompanying annoying abscess. Apparently being a type 2 diabetic and having had 23 radiation treatments that radiated the same side of your face as the tooth infection is enough of a variable to refer you to be a walk in at an ER room. Time to dig out the anti-biotics stash and wait the latest Noreaster out. So, I have stuff to mail. If you are waiting for me to mail stuff it may take a few days before we are dug out on my end. Oh, might have a Swords & Wizardry Continual Light question or two to ask our readers in a day or so based on feedback from a survey that's been up in the S&W Continual Light Community on Google Plus. 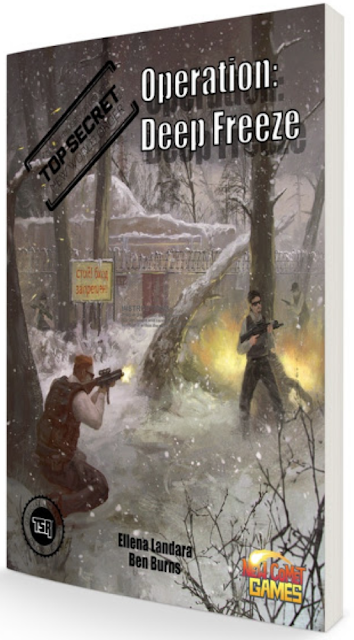 I've been playtesting the rules that became Top Secret: New World at NTRPG Con for the past few years. I like the rules because they are light yet full, allowing the game to take place without constantly referring to the rules. Perfect for episodic play, and isn't that why spy games are all about? The sweet point seems to be 18 bucks for the Print plus PDF. As for the publisher, New Comet Games, they've been good at getting projects delivered on time for various RPG systems: D&D, C&C as well as Paranoia. I look forward to reading and running their latest venture. 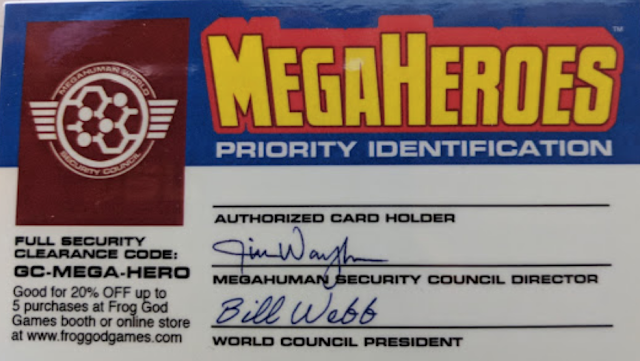 We were giving out MegaHeroes Priority Identification Cards at the Frog God Booth at Gary Con and we had a few left, so I "liberated" them. The above should email me at tenkarsDOTtavern at that gmail thing with MegaHeroes in the subject line. I need your snail mail address. I MAY be having a tooth pulled over the next day or two, so there MAY be a delay in getting this out. Won't know until the deed is done - or not. 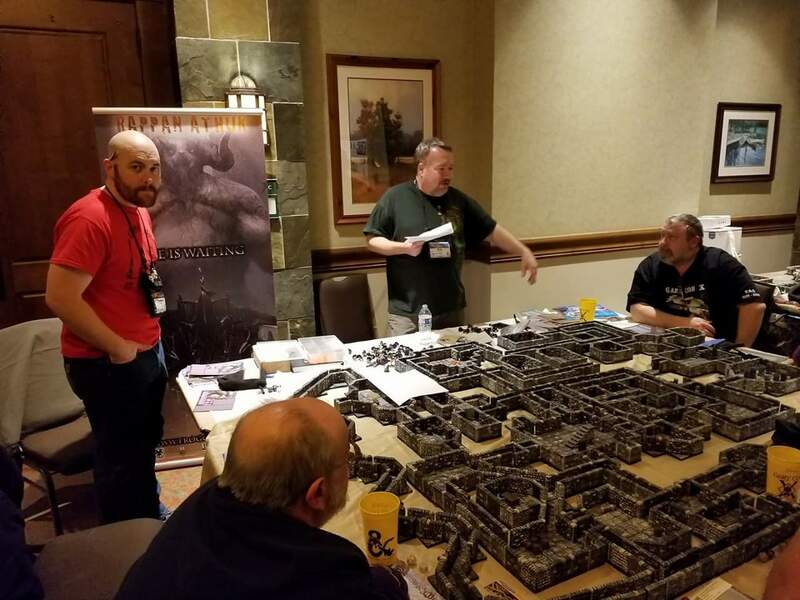 At the GAMA Trade Show, just ended in Reno, we announced that the relaunch of The Fantasy Trip will start with miniboxed editions of the two combat games, Melee and Wizard, each retailing for $14.95. The Fantasy Trip was Steve Jackson's first RPG. Its first part, Melee, was published in 1977. TFT was published by Metagaming, which went out of business about 1982, and TFT has been unsupported since then, and only available on the secondary market. 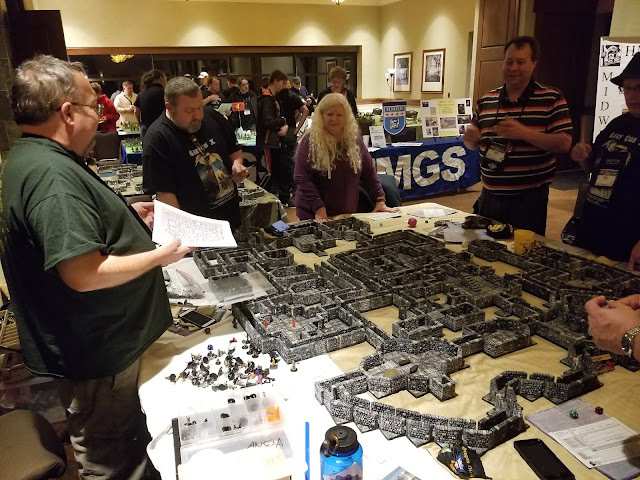 In late 2017, Steve regained the rights to the eight TFT releases that he had written himself: Melee, Wizard, Death Test, Death Test 2, Advanced Melee, Advanced Wizard, In The Labyrinth, and Tollenkar's Lair. Most if not all of this material will be republished. The format is totally up in the air right now . 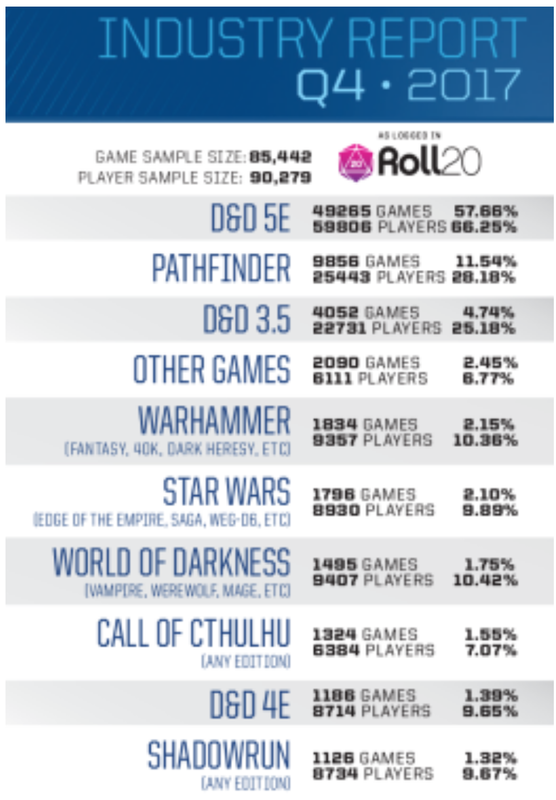 . .
Starfinder got the huge bump of a Gen Con release. 5e holds strong to the first position. Star Wars traditionally holds a top 5 spot and Star Trek Adventures is a new release. While I find the ICv2 rankings interesting, "the charts are based on interviews with retailers, distributors, and manufacturers." I prefer hard numbers. I need to find the latest ORR (Roll20) report. 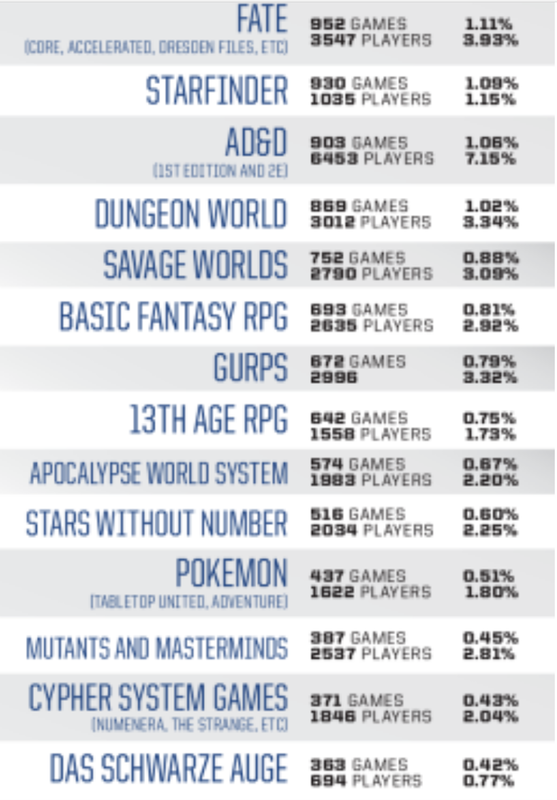 If 5e has twice the players as Pathfinder, I can see why they are rebooting to reclaim their share of the market.